Hello Friends! I hope your week is off to a great start. It's laundry day at my house, so let's get right to the coloring. I sure hope I'm not boring you with my use of Altenew's Persian Motifs. I can't tell you how much I love that stamp set. 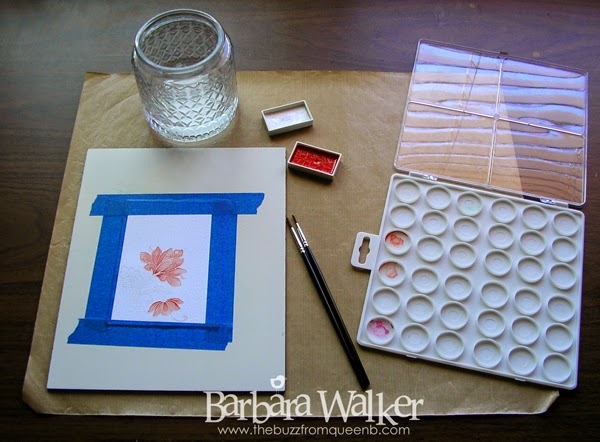 It is so fun to water color and I plan to paint those blooms every color of the rainbow. But, not today! I stamped my image onto the textured side of a piece of Distress Watercolor cardstock, using Versamark ink. 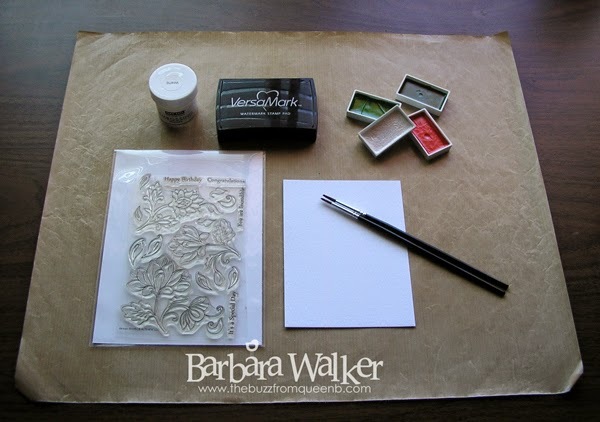 Then I sprinkled on white embossing powder and heat set it. I taped the card stock to my watercolor board with painter's tape to avoid or minimize warping. As for coloring, first the flower, then the leaves. On the right, is my Tim Holtz Ink Palette where I dilute the paints and mix them to create unique colors. 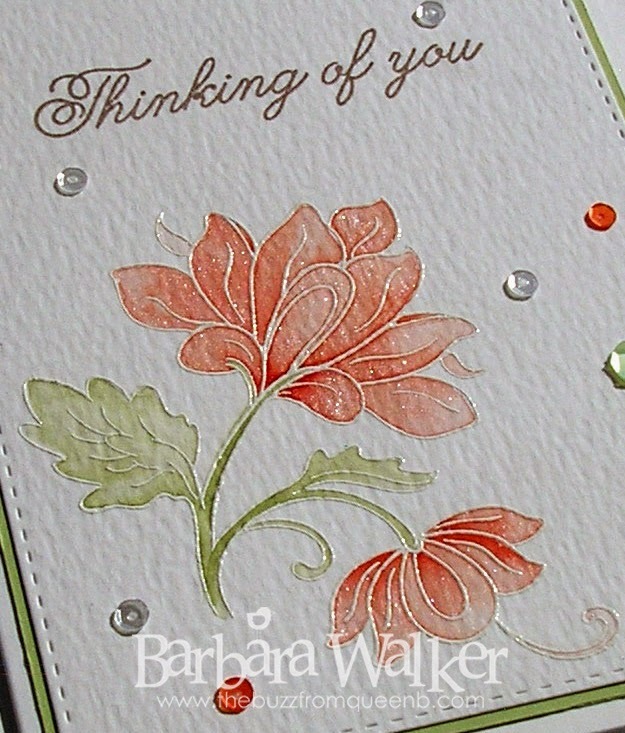 For this image, I mixed coral with pearlescent white so the bloom would sparkle and shine. I just love the result that I achieved. My watercoloring method was a little different this time. I dampened my brush, removed a bit of the water and brushed clear water onto the image. Then I dampened my brush again and picked up a little paint from the palette and painted it onto the image. I worked on one petal at a time and as they dried, I went back in and added coral to bottom of each petal. I like the play of dark and light that creates. I tell you the truth, I could water color all day! It's so relaxing to me and every project is different. I could use the same colors on the same image and I would not be able to achieve the same results. LOVE that! Each project is sort of a surprise. Here is a look at the finished card. Clean and simple and ready to mail. The Simon Says Stamp Stitched dies make it so easy to create a nice card without a lot of fuss. I like sequins. LoL! To finish off the card, I added a greeting, matted the focal with soft green card stock and adhered all of that onto my card base. Then, I added all those sequins! I guess was feeling kinda sassy, because I usually only add three. Anywho...that's my card for today. 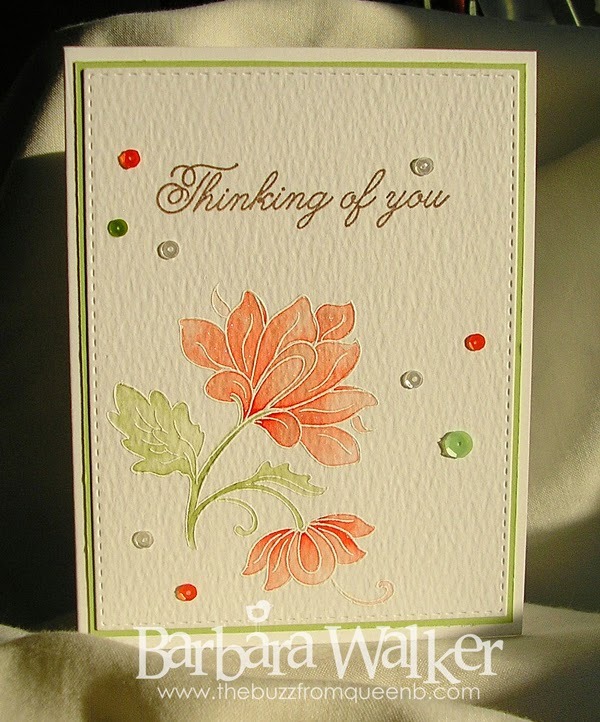 Your card is just amazingly colored, Barb. A friend of mine sent me the link to this card, knowing that I would love it! I'm just beginning to attempt water coloring, and cards like this really inspire me. This stamp set is also one of my favorites. Gorgeous work! Absolutely gorgeous! Job well done!